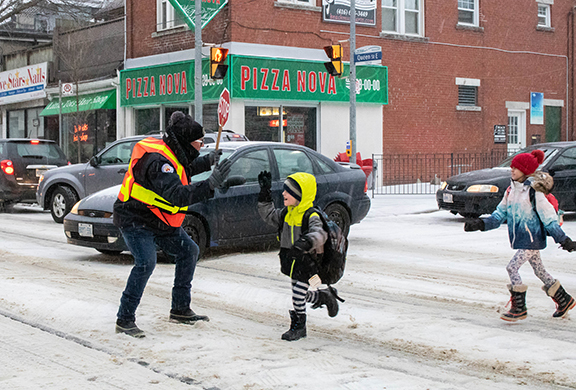 Crossing guard Paul Belyea hands out some high fives to students as they cross Queen Street East on Wednesday, Feb. 6, morning. Belyea will work his last shift at the crossing on Valentines Day. Photo by Rushanthi Kesunathan. The most popular attraction on Queen and Elmer streets isn’t the pizza parlour or nail salon, it’s a man. Toddlers to bus drivers stop to say “Hi,” and ask how he’s doing; kids run up to him for their morning fix of high-fives, and some adults give him spontaneous hugs. Most know Paul Belyea by name. For four years, Belyea had become a fixture, if not a part of the landscape to local walkers and drivers in the Kew Gardens area. He started as a crossing-guard on April’s Fools Day and will end his last shift on Valentine’s Day. Belyea now moves on from his crossing-guard duties at the intersection to instead train future crossing guards. It’s an opportunity he is looking forward to, to export lessons he’s learned from kids, families and locals, he said. “I came to be your crossing guard as someone lost in life,” Belyea wrote in a letter posted on the Beaches Toronto Facebook Group. “I can never thank you all enough for taking me into your community and treating me with such profound kindness, courtesy, and support. You have made me become a better person, to care about the well-being of others, to remember things like names, and to give some of the meanest high fives ever.” Belyea addresses the kids, parents and Kew Beach Junior Public School staff in his letter. Forty-eight-year old Belyea, a Toronto native moved back from Montreal four years ago, which he calls a second home-coming. Belyea grew up in the Kew neighbourhood, and in fact, graduated from the very school he now helps current students cross to and from. Parents have learned to trust Belyea, and it alleviates some of their parental stress from their lives, he said. “A lot of parents have allowed their kids to walk alone to school because they know I’m here and looking out for them. I keep an eye out at all times, and they see that I’m reliable and trustworthy,” Belyea said. According to Belyea, red-light runners are the most annoying and dangerous aspect of his job. These drivers are often obviously local residents, some of them sporting Beach or Beach Moms stickers on their vehicles, and they know the intersection, he said. The most brutal thing Belyea’s witnessed on the job was to see a squirrel get run over. “I didn’t know what to do, it was right when the crossing was happening and it was the busiest point of the day,” he said. Belyea uses Dale Carnegie’s words of wisdom from the book How to Win Friends and Influence People, a book he uses as motivation. 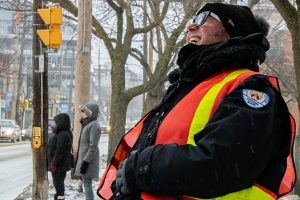 The current School Crossing Guard Program is run by Toronto Police Service (TPS) which will come to an end Aug. 1, after which the City of Toronto officially takes over, according to the Toronto.ca website. “I will be able to implement a uniform standard of safety, courtesy, and quality for a much larger collection of communities, and if so, then it will be because of you, Kew, that I was able to make any minuscule difference in the life of the city,” Belyea wrote in his goodbye letter.